Caught On Tape…Thanks To The Trash Cam! Do you remember the story we posted two weeks ago titled "Trash Cam: What Is It? And Why Do Our Clients Care?" 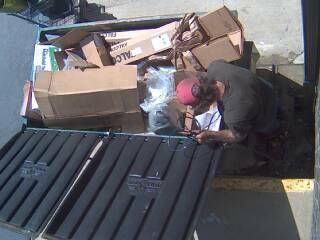 Well, now we have photographic evidence of someone that we see in our parking lot quite often these days and have captured his every move on our Trash Cam by SecureMyStuff. As you can see from the pictures below, we were able to take screenshots of the video and catch him in the act. 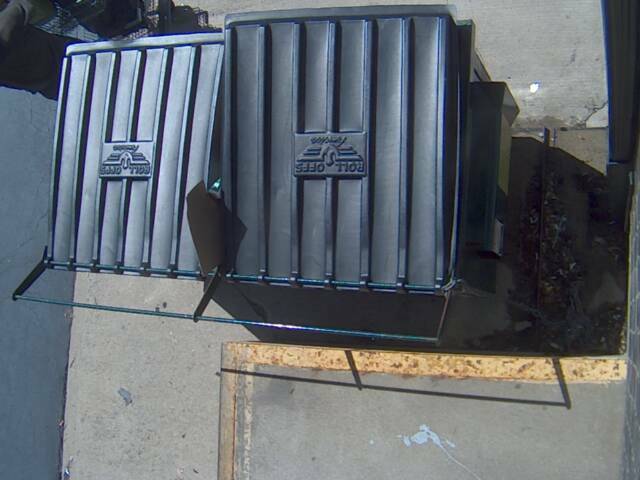 While this may be a relatively harmless example of how the Trash Cam works, you can see how handy it can be for your business during late nights and weekends when a dumpster is left alone and vulnerable in a dark alley or parking lot. Visit the demos page of the SecureMyStuff web site to see live videos of our Trash Cam and other video feeds. If you would like more information on the Trash Cam or other surveillance services offered by SecureMyStuff, call us today at 1-888-536-8661. This entry was posted	on Monday, May 9th, 2011 at 2:52 pm	and is filed under Trash Cam. You can follow any responses to this entry through the RSS 2.0 feed. You can leave a response, or trackback from your own site.